Multiplayer isn't feasible for State of Decay, but it could one day be a core mechanic in State of Decay 2. It's true that not all videogames require co-op, but in certain genres it's an incredibly natural fit. Zombie games in particular seem well-suited to team-based gameplay, as seen in Left 4 Dead, Dead Island, the various Call of Duty zombie modes, and many more. Fighting ravenous undead hordes is just more satisfying when you can do it with friends, which may explain why co-op is the most requested feature for Undead Labs' State of Decay. Unfortunately, after months of weighing its options, the game's developer has decided that multiplayer support simply isn't feasible at this time. Still, the team is aware that fans really want some open-world zombie co-op, and have promised that any future State of Decay games will use co-op as a central gameplay mechanic. "We know co-op is the most requested addition to State of Decay," executive producer Jeff Strain explained. "and we've also continued to hope it might be a possibility after release. Unfortunately, after reevaluating it over the past few weeks, we believe our original estimate of six months was optimistic; the actual time is probably closer to nine months. We could 'check the box' and shoehorn multiplayer in sooner than that, but it wouldn't be a great experience, and certainly not one we'd be proud of. It's not simply a matter of adding the technology, but also redesigning core game systems to support multiple players, and then adding new content designed for people to play together," Strain continued. "It's easy to imagine how all that would come together - as many have said, the game is practically begging for it - but retrofitting the game to add that experience would take the rest of this year, and well into the next. Worse, it would preclude our ability to offer any other kind of support for the game, including Title Updates and DLC." The news is certainly disappointing for fans who wanted multiplayer from the beginning, but Strain ended on a high note. 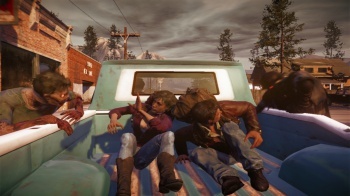 "I can say definitively that multiplayer will be the absolute heart of any future State of Decay games. As many of you know, we've always had ambitious plans for the future of State of Decay, and those plans have not changed." Before everyone starts hurling wallets at their computer screens, remember that this isn't exactly a State of Decay 2 reveal. Right now, Undead Labs is primarily focused on supporting its new game and readying the PC version, not designing an all-new game from scratch. That said, State of Decay has done pretty well financially, so a multiplayer-focused sequel might very well be in the cards. In the meantime, State of Decay's solo gameplay should go a long way towards satisfying your zombie survival itch, even if it seems a little lonely for now.